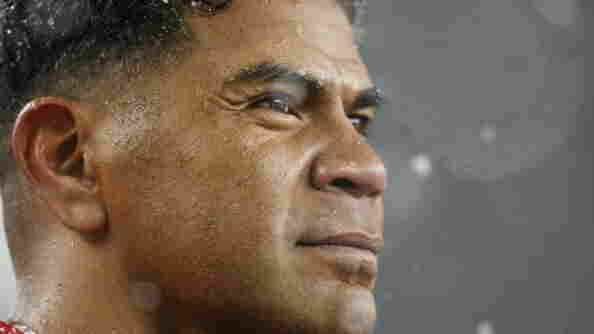 Family Of Hall Of Famer Junior Seau Settles With NFL Seau's family opted out of a $675 million concussion settlement covering more than 20,000 retired NFL players, and reached a separate agreement for an undisclosed sum. NFL linebacker Junior Seau died from suicide at the age 43 and suffered from CTE. His family announced on Friday they had settled a wrongful death lawsuit against the NFL. Steve Strauss, a lawyer for Seau's family, said Friday that they are relieved to have reached a settlement. Strauss told NPR, "When their father Junior tragically ended his life at 43, they were fairly young children. One was a minor, and so this has been going on almost six years. I think they are very relieved to have this behind them, and to move on with their lives." Seau's family filed the lawsuit after sending his brain to the National Institutes of Health for examination, and opting out of a $675 million concussion settlement covering more than 20,000 retired NFL players. That plan pays up to $5 million to families of players like Seau who were found to have CTE. In a court filing, lawyers for Seau's family dismissed their case against the NFL, and said they had reached a confidential settlement. "The NFL concussion litigation, and particularly Junior's case, brought a lot of light to the problem in professional football and society about these concussive brain injuries that players are suffering from, and the impacts it has on them and their families," Strauss said. The National Institutes of Health announced in 2013 that Seau's brain showed "cellular changes consistent with CTE." Symptoms of the condition include headaches, depression, memory loss and dementia. "Seau's suicide was the third by a former NFL player since February 2011. First, former Chicago Bears safety Dave Duerson shot himself in the chest — after writing a note asking that his brain be studied for chronic traumatic encephalopathy — a disease linked to depression. Then last month, former Atlanta Falcon Ray Easterling shot himself in the head. He was part of a lawsuit against the NFL over head injuries and was suffering from dementia."